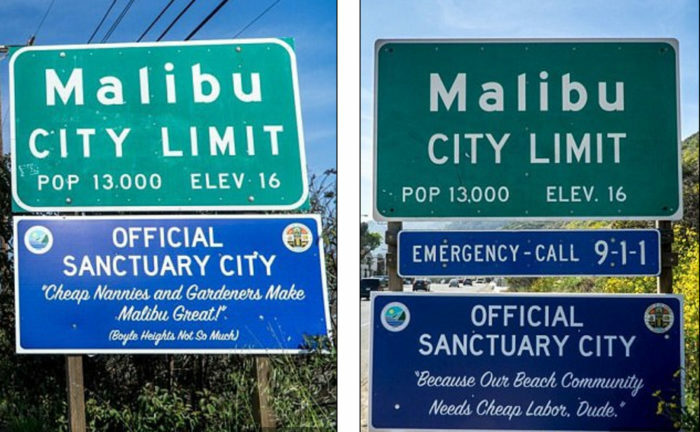 Official-looking signs boasting Malibu’s sanctuary city status were installed at the city limits. The elite enclave of Malibu, California appears to have been the target of a ring-wing prank. Official-looking signs were set up at the city limits on Tuesday, boasting about the town’s new status as an ‘OFFICIAL SANCTUARY CITY’. But drivers who looked closer saw that not all was as it seemed. Both signs had taglines criticizing the picture-perfect veneer of the wealth Los Angeles suburb. City council members said that the signs were a prank, and they were taken down by Wednesday morning. No one has taken credit for the signs so far.